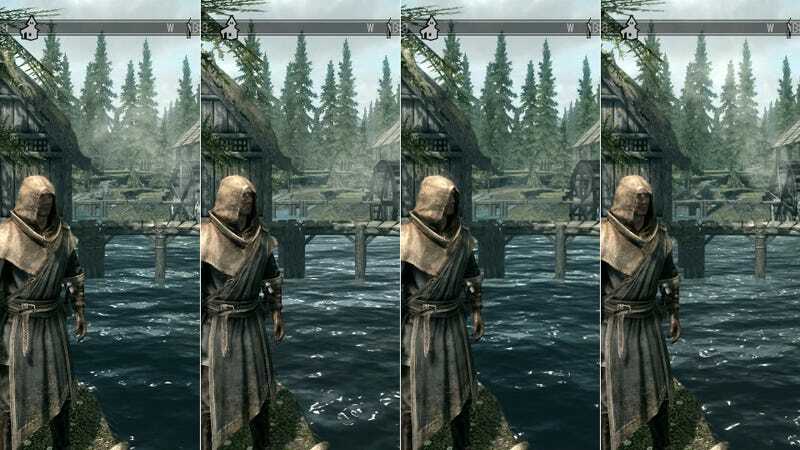 A user at Bethesda's forums has posted four screenshots of Skyrim running at its four basic PC graphics settings: Low, Medium, High, and Ultra. We've already seen that the required system specs for the game aren't to bad, though to run on Ultra you'll need a bit more under the hood. I've been playing on 360, and it looks pretty damned good, despite some cruddy textures and animations. Looking through these screens, I'm very much looking forward to seeing the game running on PC, since the 360 is probably comparable to the "low" image here, stretched onto a TV. That lead image is just a composite—the four images are located in the gallery up top. Click 'Expand' to see them embiggened.